Liverpool’s most successful gymnast Beth Tweddle is supporting the British Heart Foundation to help promote heart healthy lifestyles in schools. The triple gold medallist is highlighting the importance of physical activity and heart health in young people. The former Olympic gymnast said: “It’s fantastic for students to take part in physical activity that is fun, rewarding and heart healthy. Former Dancing On Ice champion Beth joined in King’s Junior School’s awards ceremony to present the young champions in Chester with their sporting prizes. The initiatives, organised by the BHF, promote the importance of maintaining a healthy heart through regular exercise while raising funds for the BHF’s vital research to prevent, treat and try to cure heart disease. These schemes also allows schools and youth groups to keep 20% of the money they have raised, which they can put towards new equipment and resources to promote a healthy lifestyle. Beck Bayram, BHF events project manager, said: “It is fantastic to see such enthusiasm. We really want to encourage as many schools as possible to get involved in our sporting initiatives. 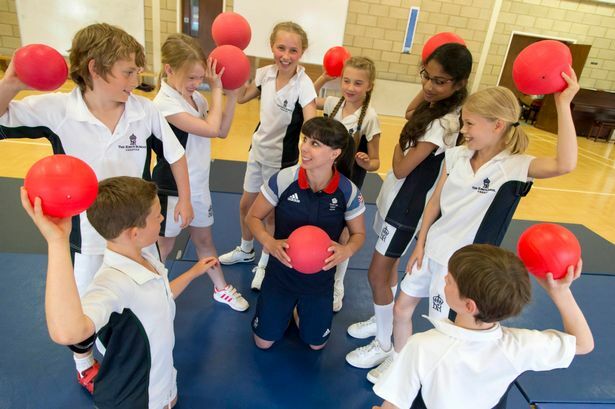 “Jump Rope For Heart and Ultimate Dodgeball are a great and fun way to get kids involved in energetic, heart healthy exercise, whilst raising funds for the school and the BHF.